Rice flour, sugar, lime and water. Rice Pap is a traditional West African recipe, a classic which is served as a starter at social gatherings. How to make rice pap? 1. Mix rice flour and some water to form a smooth pouring paste. 2. 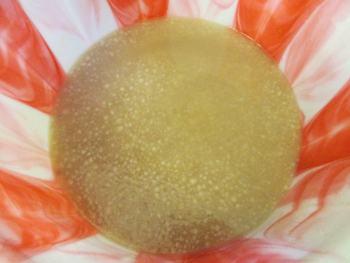 Dissolve the sugar in the remaining water in a saucepan and bring to simmering temperature. 3. Gradually pour in the rice flour paste stirring all the time so as to avoid lumping. If lumping is desired the rice flour should be especially treated by sprinkling water on the flour and rolling the droplets into tiny balls which are added at this stage. 4. Cook gently at boiling point until the raw flavour disappears and the consistency is thick. 6. Serve hot or cold in cups, drink glasses or as porridge in a bowl. Important Nutrition Information:- High in calories. Value may be improved by adding milk to mixture or serving as porridge.